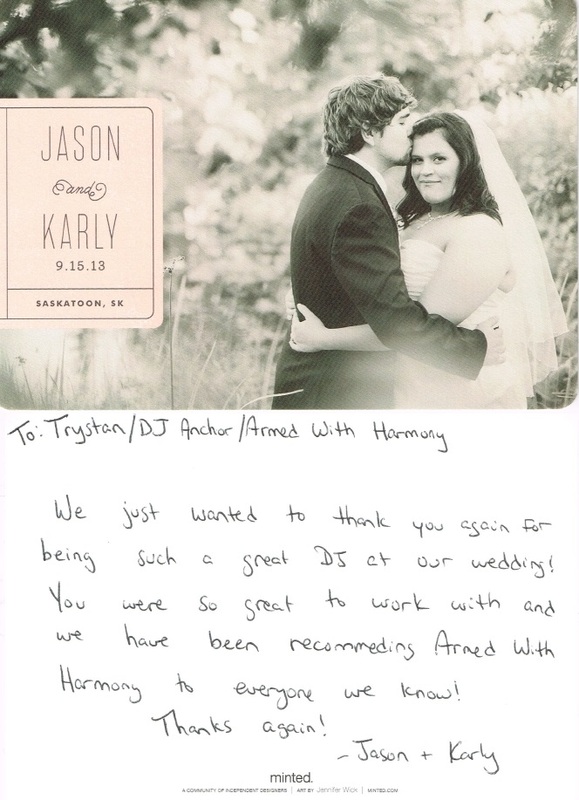 Armed With Harmony Music Services was the ONLY Saskatoon DJ company to recieve this award! 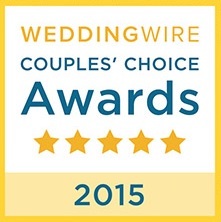 The Wedding Wire Couples Choice Award! 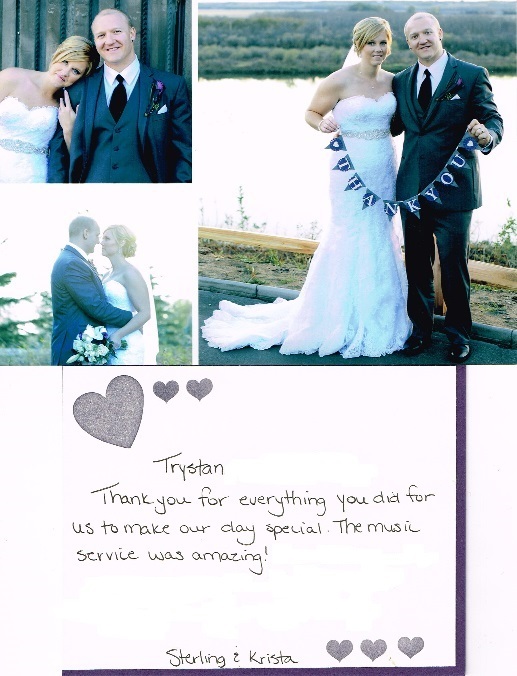 Thank you to all of our 2014 Brides & Grooms! Dj Nick Ruston played ALL our guests request, we couldn't be happier! 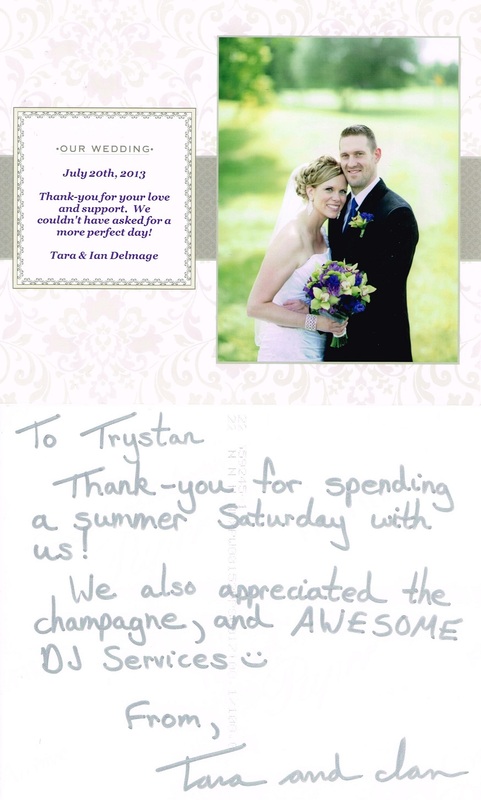 Trevor & Amber Wedding Aug 17th Hanley, Sk. 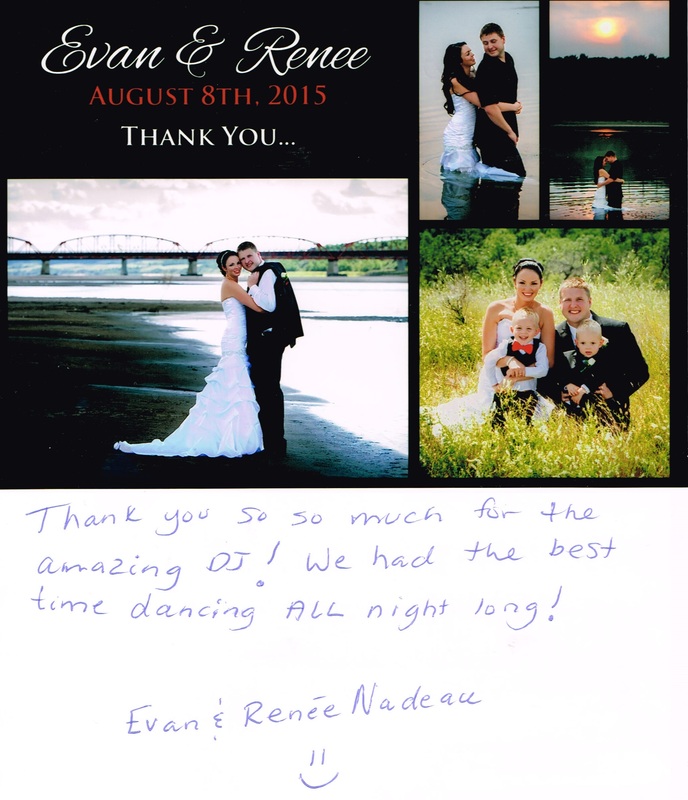 Aaron & Lin Wedding, Aug 17th Candle Lake, Sk. Dj Nick Ruston as become a local favorite in this neck of the woods! Glad to have booked Armed With Harmony! Amazing night! Pete & Karen Wedding Aug 17th Colonsay, Sk. Our Annual Halloween party was a huge success once again thanks to Dj Anchor, best party in years! I specifically sent people up request the Chicken Dance, when I knew I had already put it on the "do not play list" Dj Audio politley explain to my guests that the groom didn't want it. He never played it, even after all those requests. That is exactly why I went with Armed With Harmony, you listen! You had the dance floor going all night, thats all we could ask for! Dj Audio did such a great job that the other wedding in the hotel left their dance to join ours, the party was going all night. We will be recommending you to all our friends! 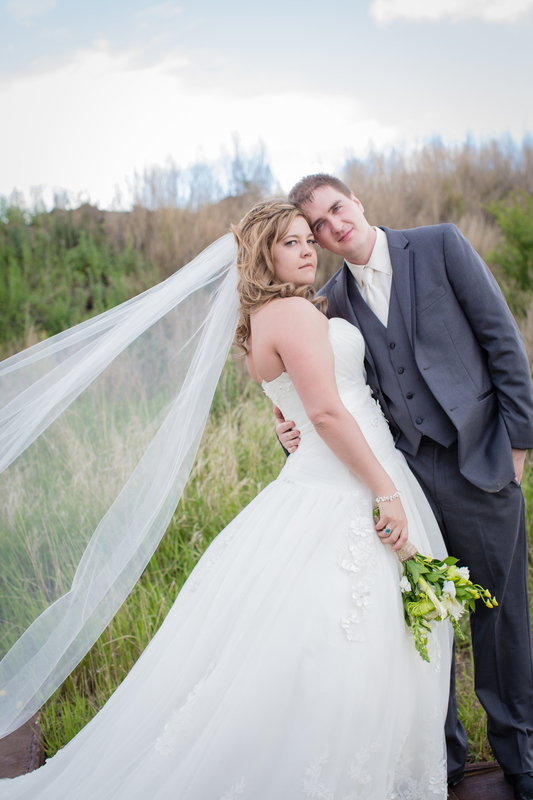 Cathryn Baird Wedding July 20th/2013 Ogema, Sk. Event was a huge success and the music help made that happen, we will for sure have you back next year. Thanks Dj Anchor. The party was out of control in a good way Dj Christopher had people going crazy all night! Wedding Of The YEAR hands down! 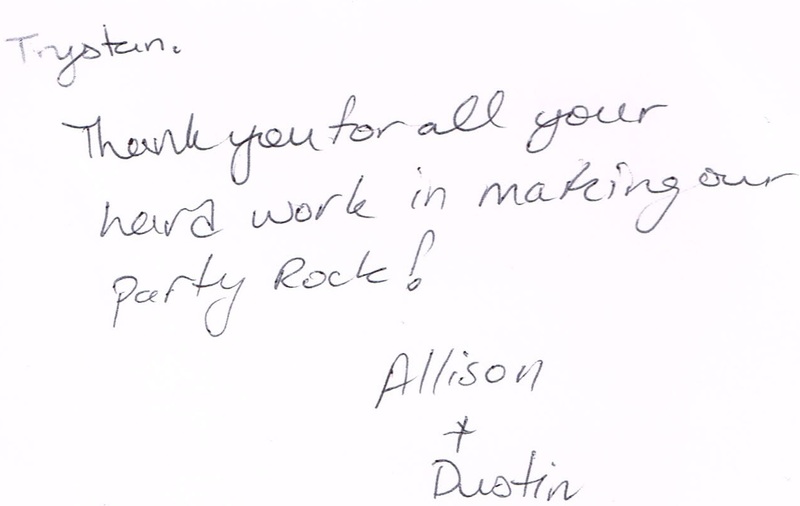 Thank You Dj Anchor & Dj Nick Ruston. 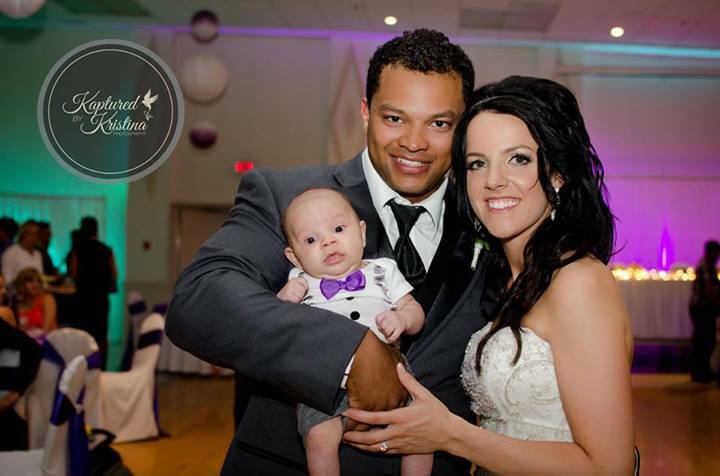 Jason & Lindsay Kruger Wedding Uniplex/Jubilee Room July 6th 2013 Humboldt Sk. Shawn & Christina Wedding June 22nd St. Joe's Hall Saskatoon, Sk. Thank you Dj Anchor for being part of our reception and helping to make it such a fun night! Everything was awesome!! Dj Memo knew axactly what the kids wanted and had them dancing till the sun came up. People are still talking about how awesome it was! June 27th/2013 Delisile High School Grad, Delisile, Sk. Chris / Dj Haywire was awesome! Def got the atmosphere going! Dj Memo knows how to rock a party! All the kids had an absolute blast! Will have you back next year! June 7th/2013 High School Dance Hague, Sk. Dj Nick Ruston had the party going from the 1st song right to the last! Amazing job! 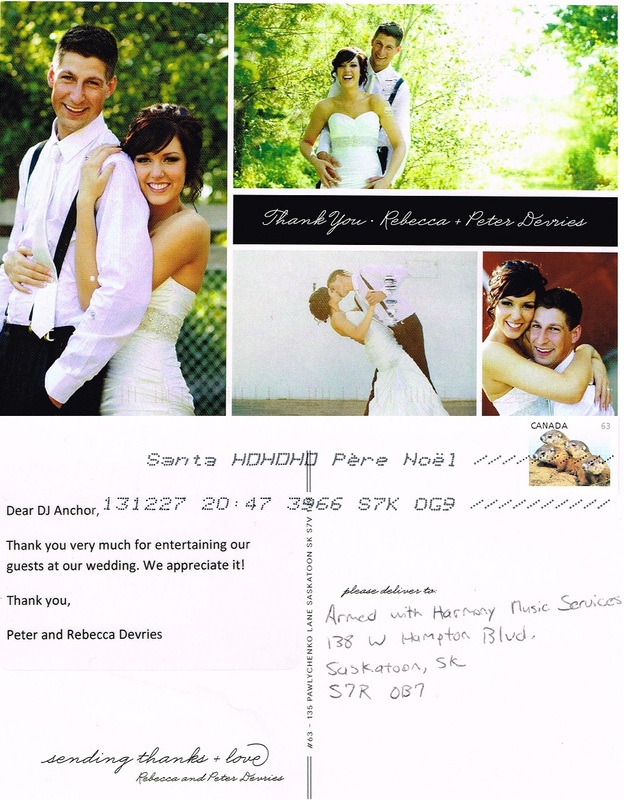 June 3rd Wedding Prince Albert, Sk. You guys were amazing, through the long planning process, many e-mails, 2 rehersals and even a day before big change, you didn't miss a thing. 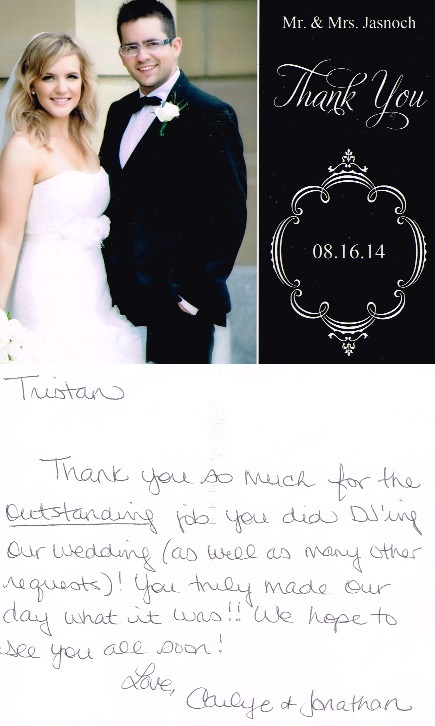 Great service and amazing professionalism. May 25th CHL/Canadian Hockey League Awards, Saskatoon Sk. We brought you guys back becasue the last one was amazing, and you blew our minds again! Dj Memo rocked the house! May 19th Walter Murray High School Grad, Saskatoon, Sk. Dj Nick Ruston played all our requests and kept our guests dancing all night. Great work, a night to remember! 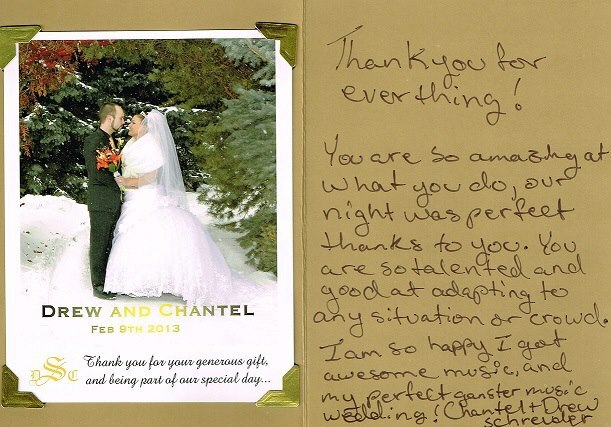 May 18th/2013 Wedding, Saskatoon, Sk. I cannot thank you enough for providing us a wonderful, stress-free FUN evening! You are incredible. I've had so much positive feedback about how great the dance was, so THANK YOU again and again. 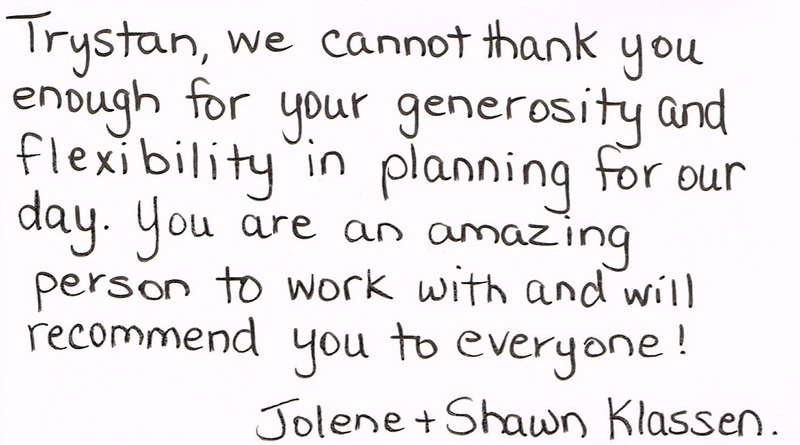 We will be recommending you to anyone and everyone we can. You were amazing! Absolutley amazing, dance floor was packed all night, best we've ever heard, thanks Dj Anchor. April 27th Mike & Hazel McLaughlin Wedding Forestry Farm, Saskatoon, Sk. This is the longest anyone has ever partied at a Juno after party ever! Dj Anchor you had it crackin till the early morn! All the artists loved it, great work my friend, and a big thanks from Universal Music! You take the event to a whole new level and I can't thank you enough for that! There is a reason why we keep booking Dj Anchor...people want him back, period! Thanks so much for your help in this great cause! You braugh a huge party! All the athletes had a blast! I had so many compliments on the DJ! 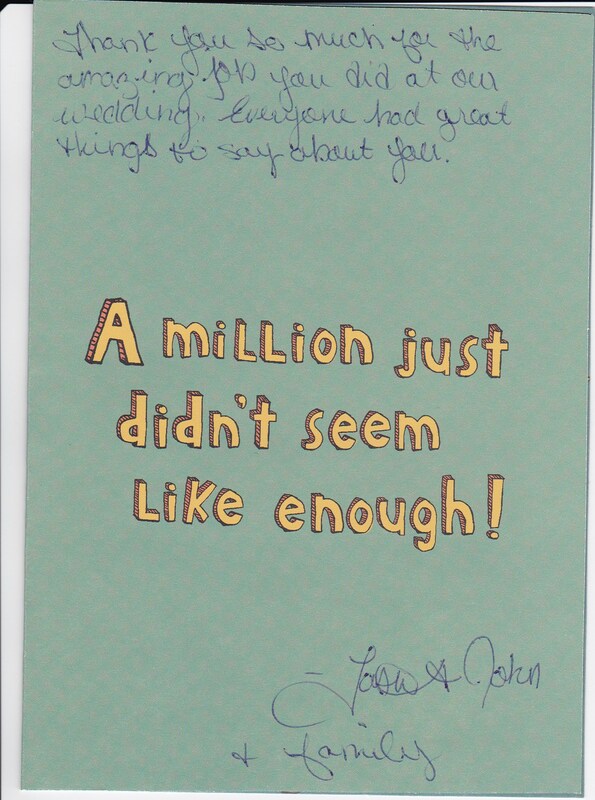 So thank you for making me look good as a party planner! What a show!!! Music was loud and the music videos were awesome, all the kids loved it! Thanks again for the dance! 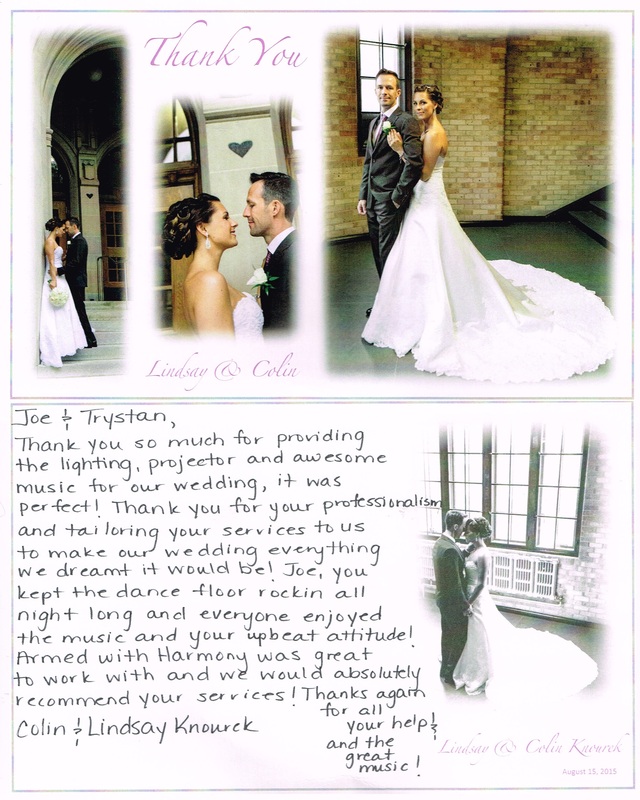 We had awesome feedback! Been using you for 5 years now, for all our In Store events and Christmas party and people keep asking to bring you back, you must be doing something right! Always a pleasure to hear you play Dj Anchor. Dj Haywire absolutley amazed the kids with a TRIPLE Music Video show, best we've ever seen! All the kids freaked out when they heard Dj Anchor was coming, and you didn't dissapoint!